I say “mythical” because I’m not sure Dartmouth’s community really exists. 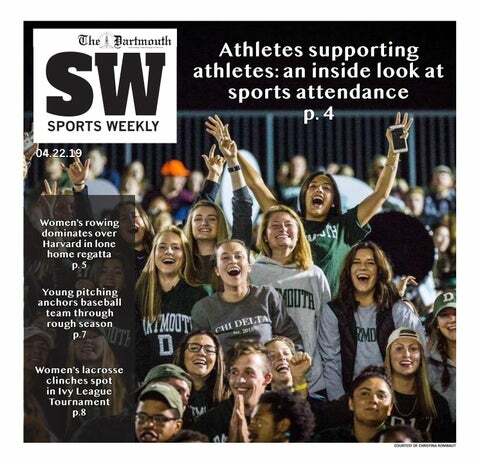 Dartmouth’s community is advertised as this passionate, loving, all-consuming entity in which first-years feel welcomed from the moment they step onto Robo lawn during Trips. While that welcoming spirit is undeniably present at many moments, Dartmouth’s community feels fractured to me. My first winter, I learned how much I could hate Dartmouth. I was not taking hard classes, and it was snowing a lot, which should both be positive things, but I was floundering in search for something that could be mine and a place where I could feel at home. Memories of fall of my first year feel hazy and overwhelming. Nothing stuck from that fall besides my academics (taking History 24, “The Cold War & American Life,” was the best decision I have made in my time here — that professor is now my thesis advisor). That failure to find solid ground in the fall — I joined no clubs and became a member of no groups — translated to feeling lost in this supposedly close community. I learned a lot that winter about the worst in people; simultaneously, I realized how much I longed to find a community within Dartmouth, because “Dartmouth” as a community just was not enough. Being a Dartmouth student gives you a sense of camaraderie, not necessarily a supportive community. Whether or not communities, by default, must be supportive is a question for another day. But in my imagination, in a community, people actively care for one another. That winter, I didn’t feel cared for. My second winter, I began to find spaces that cared for me. Beginning to work out what I had valued over my first year and a half, I realized the communities I valued were exclusively female. In the female-dominated social spaces and the group chats that were never silent, I began to build my community out of the women here. That same winter, I took Religion 20.2, “Magic, Science & Religion,” hoping to learn about magical worlds (we did not). That term I learned the magical world was not some alternate universe but finding magic in the mundane of Dartmouth: in the pleasures of sending music to friends, in the dependency of a weekly lunch date, in teaching skiing and in beginning to find my voice about how I felt toward Dartmouth. I started writing more; I remember best a piece for Mouth entitled, “How are you?” about how fake our daily interactions here are and an anonymous submission to Voices that winter. At Voices, when a girl walked out onto the stage and began telling my story, tears started streaming down my face. My friends enveloped me in hugs and held me and reassured me that my story was important and I didn’t sound stupid. These women caring for me reminded me that I had found my own little community here at Dartmouth. My third winter, I found joy in Dartmouth. Not for the first time, but for the most sustained time. I wasn’t taking classes, and the issues that typically characterize my terms here – insurmountable workloads and stress – faded away into research I enjoyed, wintery adventures that let me explore the beauty of the Upper Valley and dedicated viewings of “Jane the Virgin.” Happiness is so fleeting here; one moment, I can feel so happy and so content, thinking, “Wow, I love this place,” and the next, I feel so dejected and drained that I don’t know how I have ever enjoyed school. But that winter, that third winter, reminded me of all the love that exists in my life because of Dartmouth. All the magic of music blitzes and yummy sandwiches on sourdough bread and drinking good beer with good friends. Now, during my final winter, I am struggling to reconcile the moments of magic in this place and this community with the moments where I feel as lost as I did that first winter. I try to understand how a place that has brought me my closest friends and helped me uncover my academic passions has also been extraordinarily challenging and draining. I am trying to help spaces and communities I belong to and care deeply about become more inclusive. But I struggle with how communities premised on exclusivity, like Dartmouth itself, can ever be considered inclusive. I am frustrated by the failures of our community, from the small to the large, and the current inability of Dartmouth to make every student on this campus feel supported and protected. I am frustrated by the trust that should be there in a hookup that is not, by the lack of support for the most marginalized students here and by the notion that one Dartmouth community fits all. During the winter, Dartmouth is the best, even though it can sometimes be the worst. It reminds me that I love snow days more than anything. It reminds me that not everyone can understand Dartmouth’s community the way I do, and I can’t understand it as my peers do. Everyone at this school has competing views of Dartmouth, not only as the school ought to be but as it exists. Trying to reconcile these divergent views of a place we all share to form one opinion on Dartmouth’s community is just not possible. But I know this: I would take my friendships, the women who have made this place meaningful and magical, over this large and mythical community any day.